Give creamy butternut squash soup a flavour twist with mussels. Top with crisp sourdough croûtons for a tasty starter. For the soup, heat a large lidded saucepan and add 2 tablespoons of the oil. Once hot, add the shallot, thyme and mussels and cook for 1 minute. Add the wine and cover with a lid. 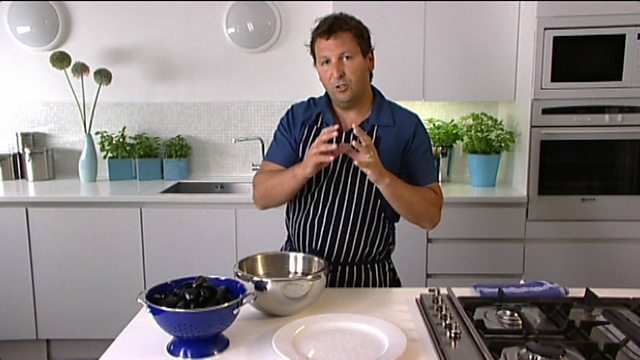 Cook for 2-3 minutes or until all mussels have opened. Discard any that do not open. Strain the mussels through a fine sieve keeping both the mussels and liquor. Remove half the mussels from their shells and leave the rest in their shells for serving. Heat a large saucepan and add the remaining oil and the butter. Once hot, add the butternut squash and cook for 2 minutes. Add the stock, shelled mussels and reserved cooking liquor and cook for 6-8 minutes. Remove from the heat and place in a blender. Blend until smooth and place back in the saucepan. Season with salt and pepper. For the sourdough croûtons, heat a medium sauté pan and add the oil, once hot add the bread and cook until golden-brown. Drain on kitchen paper and season with salt and pepper. Ladle the soup into serving bowls and garnish with the croûtons, reserved mussels, cresses and a drizzle of oil.